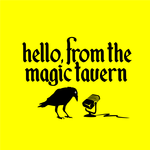 We're in a new tavern and talking to the Freshgrave Twins, two of the most devious wizards-in-training from Jizzlenob Preparatory Academy for Young Wizards. A touch too long, but fun. I like how they zeroed in on one or two aspects of the Harry Potter world and picked them apart, rather than trying to cram in everything they could. Does Jessica McKenna always sound like she's testing out a Natasha Leggero impression, or was she just going for the old-timey Mid-Atlantic film accent?